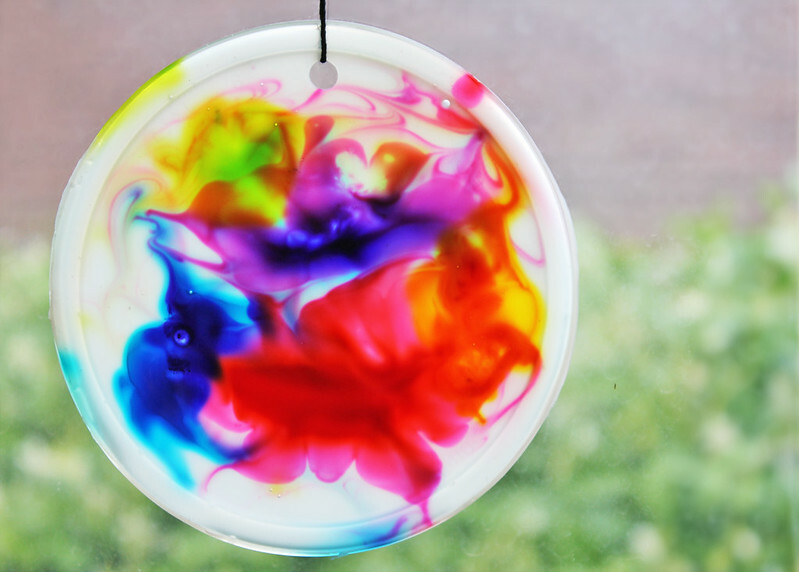 I’m always happy to find kids crafts that my children clamor to do rather than those that require me dragging them over to the table to make; these simple Cosmic Suncatchers are one of those enticing projects! I was fooling around making them when they caught my daughter’s eye and she asked to make one. Later that day her brother saw the suncatchers drying and immediately asked if he could make one….so I knew this kids project was a keeper. Best of all it takes two minutes to pull together and about 5 minutes to execute, excluding drying time, perfect for short attention spans and moms with newborns! Oh and did I say it uses recycled materials? An eco-friendly kids craft as well…score! White Glue and lots of it! Buy it in bulk here and get free shipping It’s HEAVY! Step One Pour a generous amount of glue into one of your plastic lids and swish it around to cover the entire inner surface. Step Two Have your child put one or two drops of each color of food coloring around the glue. Step Three Give your child a toothpick to swirl the colors around in the glue. Stop swirling before the colors get too combined or the final result will be muddy and brown. This is an exercise in restraint! Step Four Let dry. As the colors settle they will continue to expand and create a dyed psychedelic effect….I love the 60s… Depending on how much glue you used, the suncatcher will take one to three days to fully dry. You will know it’s ready when the edges start to peel off the lid. Step Five When fully dry, peel the suncatcher off the lid, punch a hole through the top, add a string, and hang in a sunny spot. Cosmic Suncatchers remain one of the most popular projects on our blog and at in person events where we have tried them! They never cease to amaze children and adults with their swirling changing colors. I love these! Pinned it! Will definitely make with the grandkids when they are a bit older. Thank you! They are probably old enough now since it is 2016. Wow! Love this! Pinning and making mental note to save some plastic lids! Hopping over from Sun Scholars. Thanks Georgina! I love your blog too! hi, thanks for the inspiration! just wondering- how did you make the colours so blurry? is that the water colours? from the food coloring it didnt work for me. Hmmm the colors blurred when we left them alone in the glue, which helped to slowly dissipate the color. What happened with yours? Did you use white glue? would a simple flour and water homemade glue work? I live in a tiny village in the south of Grand Canary Island and I don’t have easy access to a lot of supplies. I would really like to do this with my kids’ group. Excellet crafty idea to brighten up winter days stuck inside, thank you. They can also stick to glass and peel away later. What kind of glue did you use that it didn’t dry clear? I kind of like the effect as it brings out the brightness of the colours! We used simple white school glue. It dries sort of cloudy. Glad you liked the effects! Glad you like it! Hope your kids love it as much as mine did! Love the marbly outcome! This will be one fun group activity to enjoy with my friends 🙂 Thanks for the inspiration! Thanks Onel! I absolutely love your blog so I’m pleased to hear you liked this project! Since this is glue, will it get brittle over time, esp in the sun? Really great question! I kept ours in a sunny window for a couple of months and they got harder but not necessarily brittle. The interesting thing was that after about a month I noticed the colors shrank and had changed! A friend thought it might be that the colors were fading but since they still looked very vibrant just “different” than they did when we first made them I wondered if the food coloring and glue continued to react over time in the heat of the sun. I’d love to hear how everyone else’s turn out over time! It’s an ongoing science lesson! We made these as kids with PVA and glitter as Christmas decorations, and 20+ years later my mother still has them with all the Christmas decorations. They have yellowed a bit and lost some of the glitter but are still going strong. Not brittle more rubbery. Must make these again with my 2 year old. So awesome to hear Kellie! They would make fantastic Xmas decorations! Now that’s a fabulous small and fast art project! 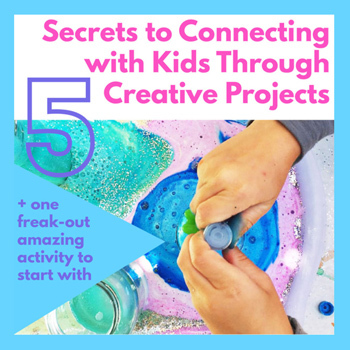 My little boy loves making things with me, but he doesn’t have a particularly long attention span, so I’m always on the look out for quick and attention grabbing projects. This is perfect! Thanks Ana! One question, where do you find your big squeezy bottles of food colouring? Thanks so much again! I’m glad you liked the project! I bought our food coloring at our local grocery store. If you want mega sizes of food coloring, restaurant supply stores often carry them, like Smart and Final. Just did this with my kids who are 2,5 & 13 and they all loved it. Can’t wait for them to dry so we can hang them! I’m so happy to hear it Julia! We made these but the glue curled up as it dried. Did you have that happen at all? Ours are all curled up. Oh no! I didn’t have that happen Lisa 🙁 What type of lid and glue did you use? maybe we can figure out why…..
Perhaps your layer of glue was too thin. I have used white glue a lot and know that the thicker a layer is, the less it will curl. Hope this helps. One more thought, did you use a lot of glue? You need a really thick coat of glue as your base. LMK! We did this and they look great, however, the food colouring hasn’t dried (although the glue has). Any ideas why? I was thinking we may have to paint a coat of varnish over them to seal in the colours….I am now testing out a couple with glitter sprinkled in them to hang on the tree for Christmas! Hi Susan, Interesting……I did notice that after about 6 weeks of hanging in a sunny window the food coloring contracted. There must be something in the chemistry of glue/food coloring combo…..but I’m not a chemist so I’m not sure what is going on 😉 How long have yours been drying? Mine took at least a few days to full dry. 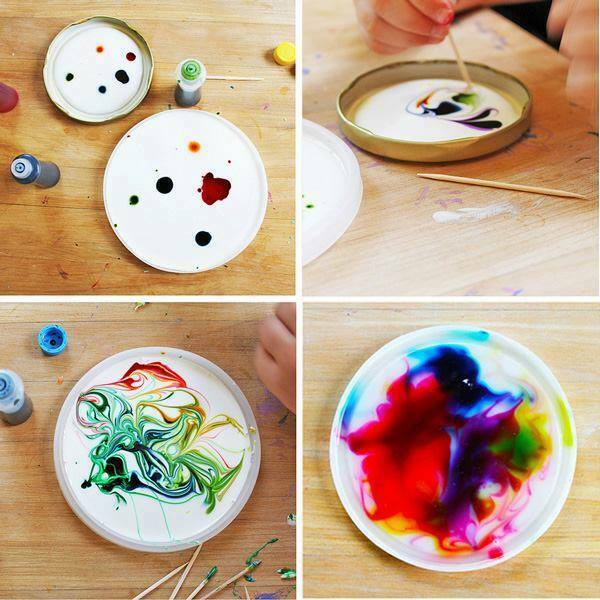 These are beautiful and look like a lot of fun to make too! I’ve featured your idea on The Crafty Crow today! Thank you so much Cassi!!!!! I really appreciate the share! Did this with the kids today. Taking a bit long to dry, but they loved it! Hopefully the finished product is just as awesome as yours. Thanks! Post a pic on our FB page! I’d love to see how they turned out! This sounds awesome! I’m looking to do this with an art therapy group. Could this work with clear glue as well? Does it matter if the lids have designs on them? How did you get yours all white? All of the ones I am collecting have designs on them (yogurt, margarine etc). Since the last step of the project is peeling the dried glue off the lid you can definitely use lids with designs on them. Just make sure they are flexible 🙂 I used lids from tubs of hummus, so they were all translucent. Coffee can lids also work well. LOVE this idea! Thank you so much for this. We live outside Phoenix, AZ, and it’s already heating up here. Any projects we can do indoors are much appreciated. It’s going on our list for this month! 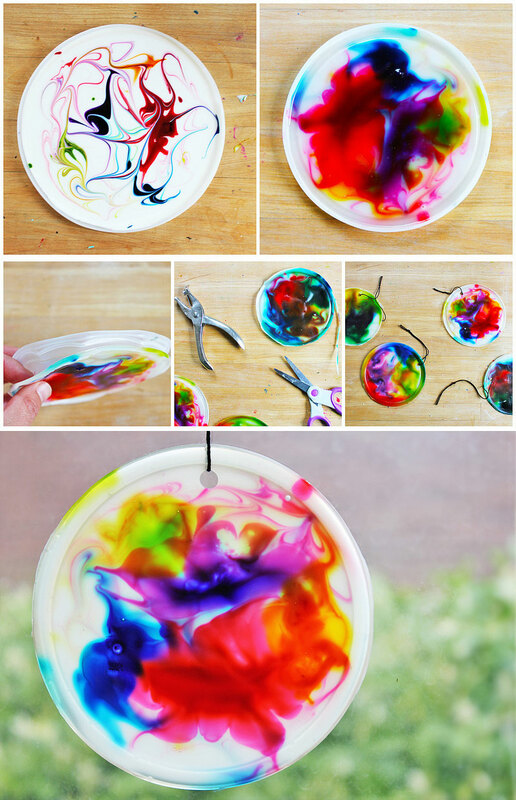 This reminds me of something similar that I have had kids do with a plastic plate, watercolor markers and the glue. They color on the plate, pour glue over it and let it dry. The glue absorbs the marker lines and blend them together. Different procedure but same result! Oooooo that sound VERY fun! We will have to try that one. can you use clear glue?? to make them transparent?? I did this with my daycare kids. Obviously didn’t use enough glue as once dry, the suncatchers didn’t peel off the lids. They just stuck to the lids. These were supposed to be Mother’s Day gifts. I’ll try again and use more glue next time. Disappointing as the kids were really excited to see the finished product. I’m sorry to hear they didn’t peel off! You do need a fair amount of glue for them to peel off. Still if you don’t want to use that much glue you can make them on clear translucent lids and skip peeling them off. If you were to do this would the glue ‘melt’ on a hot day. Would it work well to hang outside or would the rain/sun possibly ruin these? I had them hanging in a sunny window for about 6 weeks. They never melted but the sun does continue to change and fade the suncatchers a little bit over time. Just wondering approximately how long do they take to dry? Wow 8 days is a lot but I’m glad they worked!!!! i like to know why you use food color instead of ink?? Is is just because it is saver for young kids?? I like food coloring because it is so easy to find 🙂 Almost any grocery store carries it and it’s inexpensive. Inks and liquid watercolors (my favorite) do need to be purchased online or at art supply stores. Love this idea! Can this be done on a plastic plate? I want to do this with my daughter’s class and I am not sure we will be able to get 24 lids. Thank you! Hi Tracy, I’m not sure if it can be done on a plastic plate but do let me know if that works! If not can you ask parents to donate a lid or two each? Hi Ana–I read from beginning to end includiny every comment. I am almost 70, and I thought this might be fun for older people too. Will try and let you know!! I don’t know if someone mentioned this already, but I used to do something similar as a kid with markers. 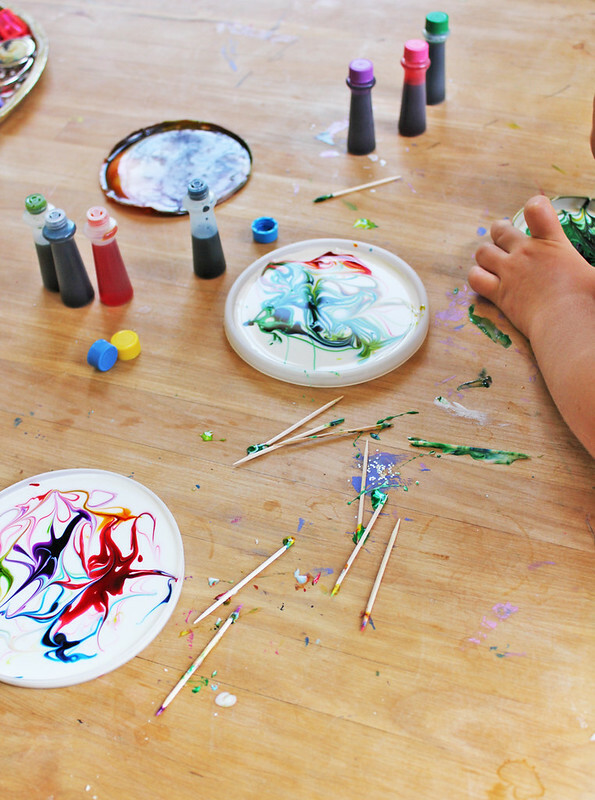 You just color all over something smooth (like these lids… or the inside of a metal desk… I don’t think my teacher was too pleased with that, lol) with washable markers and then cover it with glue, wait for it to dry, and peel it off. You end up with the same effect. Hi Lauren, You are the first to mention this technique so THANK YOU! We’ll try it out this weekend, on the lids, though, not a desk ;)! I did the experiment and it was COOL AND AMAZING!! Thanks for the cool ideas!! Yay!!!!! So happy to hear it! I’m looking to do this as a Welcome Week project for college students. Is there any way to make it dry faster by chance? I don’t know of a way to speed up the drying process other than leaving them in a sunny spot. Warm weather should probably help! This is amazing! I think we will make some fall colored ones with clear glitter glue! My 3 year old will absolutely love this!! Oooooo that sounds cool Katie! I teach at an international school in Bangkok and sometimes have difficulty getting some art supplies. I tried tempera paint and it was awful and bled instead of flowing. This will be so fun and I can get these supplies without challenge. Yes tempera is too thick. Can you get food coloring? This gave me a great idea- I am going to try a layer of glue in a plastic yogurt top, then decoupage a pretty piece of paper into it and add another layer of glue and see if that will work. I have made many suncatchers that are decoupaged so it should surely work. Thanks so much for the idea! 1st. Is Elmer’s glue good to use, or does it have to be a certain kind of white glue? 2nd. Perhaps the drying time affects the chemicals in a way that causes the food coloring to contract. Would using a hair dryer work more easily, to seal in the colors, with the glue, or would that ruin the effect? I’m thinking of possibly trying tub and tile caulking with the food coloring as well, just to see if it works better and last longer. Let me know if it works out! You can use any white glue and I have no idea what a hair dryer would do. I saw an earlier post about putting on glass. Will it last if done so? Hmmmm not sure…did you try it? We tried these, let them dry for 4ish days before taking them out of molds…however, after doing so, they folded up like tacos after being hung up. Did yours stay flat? Hi April, They do need a lot of drying time. Yours may have been removed a little too soon. If they still have some flex in them, try putting them under a heavy book for a few days and see if they flatten back out. Just made these with the kids. Can’t wait to see how they look when they’ve dried. 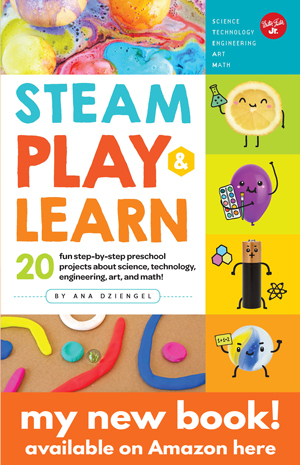 Excellent activity for a range of ages. I tried this with my granddaughter, but the colors just all blobbed together , so I washed the lids off and want to try again. I put a rather thick layer of glue on, enough that it would roll as I tried to cover the entire lid. About how many drops of food coloring did you use? I want to use them as a craft for our girls club at church with the teaching that we can all let God’s light shine thru us, regardless of what we look like:)! Help please. These are wonderful! Thank you for sharing this! They will look lovely in our daughter play room! Once I have tried them I will link you a photo of how they turned out! Did you make them? I’d love to see how they turned out! If you want to add more science to this experiment, instead of using toothpicks you just add a drop of dish soap, try and see! An amazing thing happens, the detergent moves the molecules of the glue which have polar heads and non-polar tails and they carry the color around making beautiful patterns, in addition after some time they end up just like the suncatchers in your pictures, but the wow factor while kids drop the detergent is something worth it! OH I will have to try this!!!!!! Thanks for the tip!!!! I only eneded with a little bit in the center of the plate – can you tell me what was wrong? This may be a repeat. Would homemade flour and water paste work for these lovely sun-catchers? I live in a small village in the south of Grand Canary Island and don’t have easy access to a lot of supplies. I would love to make these with my kids’ group. I’m late to this comment but am curious of you tried the flour and water paste. Did it work? Will pva glue do the trick please? I loved this. 💕💜💖 Going to do it with my grandchildren. I’m so happy to hear this!!! Great idea to use plastic plates!!! Thank you for reading Elizabeth! I helped the kindergarten class make these to hand out to their Senior Citizen day coming up here. They dried for 5 days, peeled away fine. I trimmed the edges, and now they are curling up 🙁 Any suggestions? Thank you. They will curl a bit. 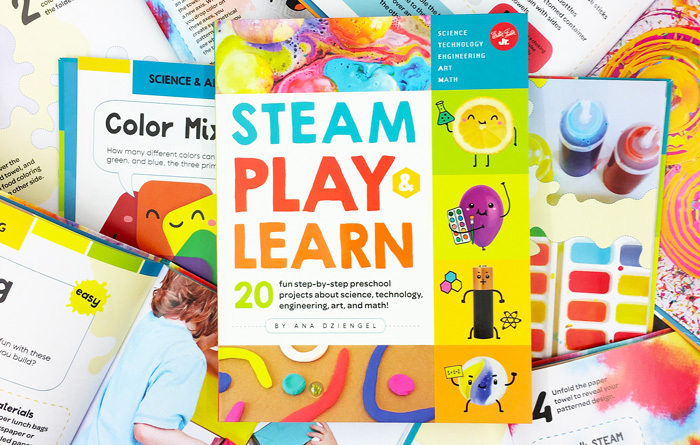 Maybe if you do it again in the future you can lay the dried ones between sheets of wax paper and a stack of books for a day or two to make sure the edges dry flat? Love this idea. I work with groups of 60 – 150 children ( local museum – school and family crafts) so sourcing enough lids could be a problem. Do you think this would work with dishes the children shape themselves from baking foil? And would poster paint work (as I have a cupboard full)? Hi Liz, Foil “plates” might work. You could also probably go to a discount restaurant supply store and purchase some plastic lids. I know the Smart and Final near us sells them and they are pretty inexpensive. You’d have to experiment with the poster paint though. I haven’t tried it so I can’t be sure, but so let me know if you try it and it works! Me encantó este tipo de arte para niños,mis hijos son asperger y me cuesta mantenerlos con algo de atención y el arte es algo que les encanta. This is great! I was wondering if you can use a jar lid and ring while making and then it peel off when dry? I haven’t tried that but it’s a great idea! 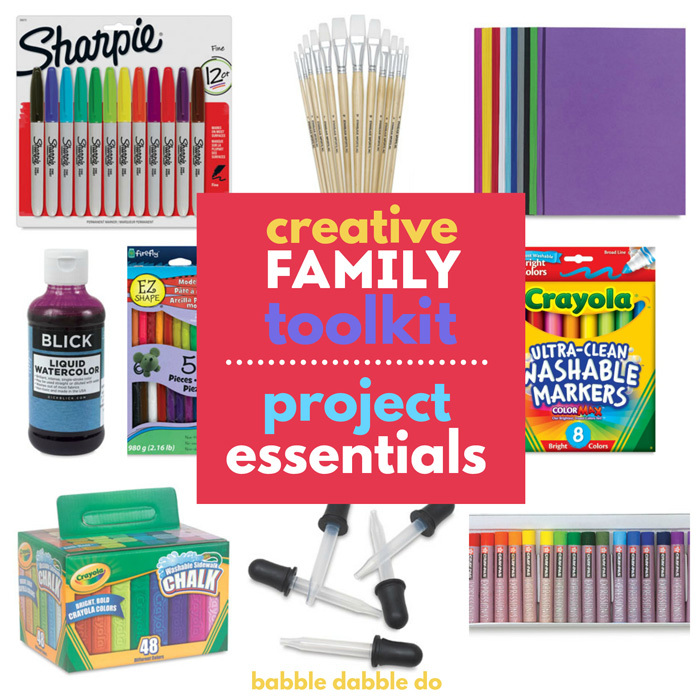 Hi Ana, I’m not even sure how I found the babble dabble do website, but I sure am glad I did! I noticed that your original post was over 3 yrs. ago. I read every response and I wanted to Thank you for a couple of things. One, you have commented back to practically everyone. So nice to see such kindness! And after reading all these comments it struck me that parents, grandparents, and all kinds of teachers are still making efforts to come together as “Families” Warms the heart. I have a 4yr. old grandson myself. I went straight to Amazon and ordered the watercolor paint. 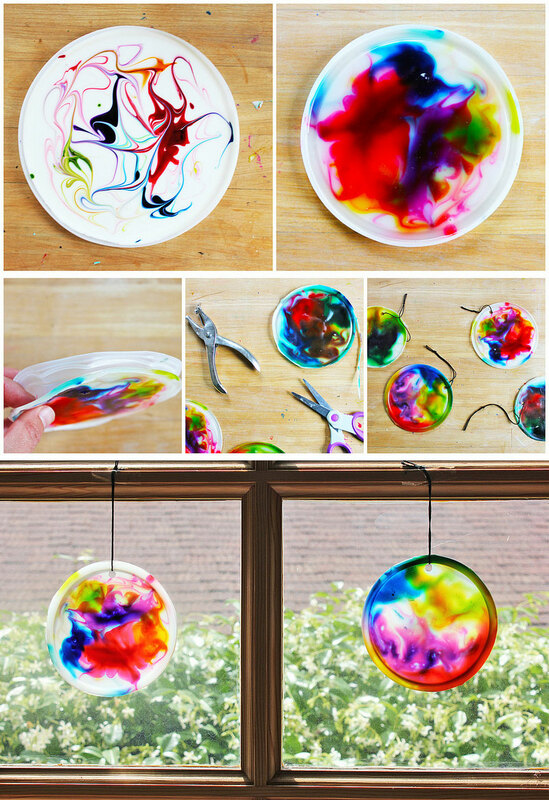 So Monday we will be making our own Cosmic Suncatchers! So again Thank You Ana, you are appreciated!